Lavish is the perfect way to treat yourself or someone special. They are accepted at hundreds of locations on an endless choice of relaxing and indulgent spa days and beauty treatments. Here are just some of the gorgeous spas that accept Lavish vouchers. Grayshott Spa - Surrey, Armathwaite Spa - Cumbria, The Grange Spa - Lincolnshire, Handpicked Hotels - Nationwide, Bannatyne Spa - Nationwide, PURE Spa - Scotland. 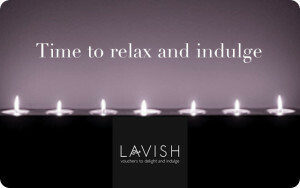 Lavish Vouchers are a perfect gift idea as the recipient can choose exactly how to tale time out, relax and be pampered! Please allow 24 hours before using your eGift card to ensure that it has been fully activated. You must present this eGift card before your treatment or service. This egift card is single use only. Please note that the list of Lavish Voucher Partners is constantly evolving and may vary from time to time. If you wish to use it at your preferred location listed on the website at the time of purchase, it should be exchanged as soon as possible after purchase. Customers should state their intention to redeem a voucher when making an appointment with a participating Lavish Partner and should present the voucher to the Lavish Partner on arrival.